Description: Grab your camera, kids, grandkids, and neighbors’ kids and join us to have pancakes with Santa Claus on Sunday, November 26 for a great cause! Sugarbush Tavern is sponsoring Anchor Bay Community Giving Tree's 11th Annual Breakfast with Santa. Your donation will provide you with pancakes, sausage, milk, juice and the reassurance less fortunate children in our community (Macomb and Saint Clair) will have the best holiday possible! Cost: $13.95 per person. Three and under are free. Description: Christmas carols, Santa visit, Elmo visit, puppets & dancers. Description: Parents, you and your kids won't want to miss this fun and festive morning with Santa as he has found time in his very busy schedule to pay the families of Macomb Township a visit. Santa has a special interactive show planned singing some of his favorite songs and telling some of his favorite stories. Afterwards, you will have a chance to visit with Santa and receive a holiday gift from him. Pictures are not provided so, please remember to bring your camera. Also included in this special morning will be continental breakfast which offers up pastries, fruit, and juice. Rumor has it there will be a special guest appearance by Frosty the Snowman and Freckle the Frog in his holiday best! Location for the 2017 Jingle Bell Brunch will be at the Marvin Blank Senior Center. Two sessions for the Jingle Bell Brunch will be offered. Session 1 will be from 9:00-10:30am and Session 2 will be from 11:00am-12:30pm. Cost: $7 for resident. $14 for non-residents. Description: Enjoy a family style breakfast of pancakes, sausage, and beverage, and give your little ones a chance to visit with jolly old St. Nick without having to wait in line at the mall. Bring your camera and a wish list. Mrs. Claus and some of her friends will be on hand to visit with and entertain guests. Breakfast will be served by volunteers from Eisenhower Key Club promptly after doors open at 9:30 a.m. and 11:30 a.m., so please don't be late. No high chairs or booster seats are available. Reserve your seats now, as there are no sales available at the door. Please indicate which seating as well as the number of children and adults attending. Bring non-perishable food items for the Feed the Need Program. Seating is limited, and the fee must be paid for any person that sits at the table, regardless of age or whether they eat. Fee is $7 per resident or $14 for non-residents. Between the hours of 1-4 p.m., you will find Christmas activities for the whole family. Santa will be here at the Crocker House for “take your own” photographs in the nursery. Elf on the Shelf will be telling her Christmas story and carols will be played on the old pump organ. The kids can make their own scrap-art cookie and then enjoy coloring while eating cookies and watching old silent Christmas films from the turn of the century. You will then find trolleys of the season in the historic Mount Clemens Depot and “make & take” crafts at the Anton Art Center. Entrance fee at each location. 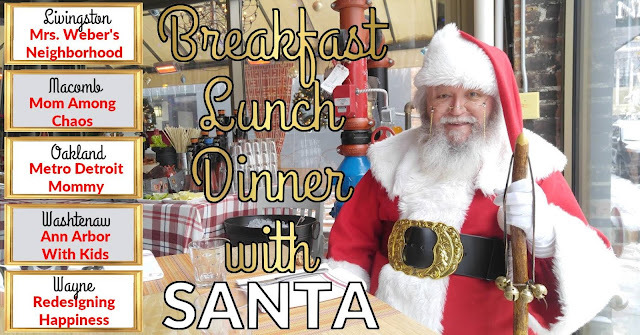 Description: Enjoy a dinner, along with some festive activities and a visit from Santa and Mrs. Claus. Parents are encouraged to bring their own cameras to capture this magical time with Santa and Mrs. Claus! Registration deadline is Wednesday, December 13th, 2017. The cost is $10 for residents and $11 for non-residents.